Unfortunately, we have had to cancel tomorrow's (22 May) Jay Treaty Conference. We are very sorry for any inconvenience. We will inform you of any future scheduling. Thank you for your understanding. 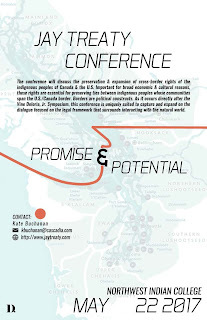 If you have any questions, please contact Kate Buchanan at: kbuchanan@cascadia.com. The conference will not longer be starting on Sunday, 21 May and will only be taking place 22 May 2017. Please contact Kate Buchanan at kbuchanan@cascadia.com if you have any questions! Registration is free ~ register here! 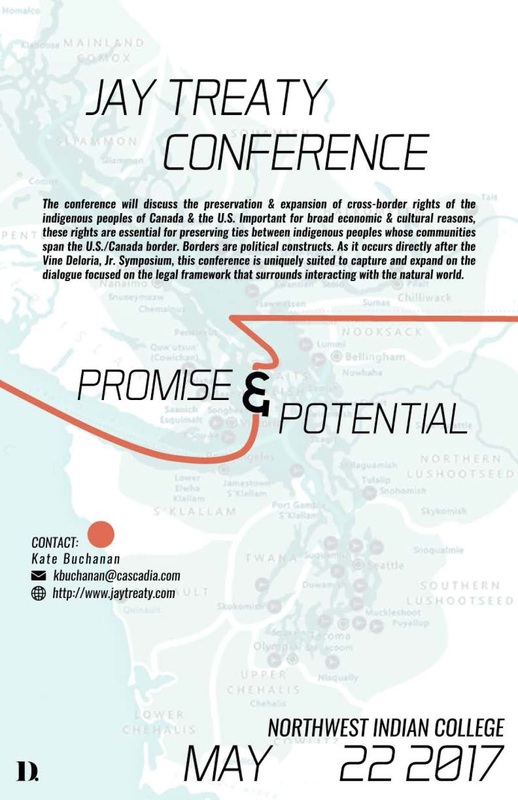 The conference will discuss the preservation and expansion of cross-border rights of the indigenous peoples of Canada and the U.S. Important for broad economic and cultural reasons, these rights are essential for preserving ties between indigenous peoples whose communities span the U.S./Canada border. In 1794, the United States and Great Britain negotiated the Jay Treaty, established in part to mitigate the effects of the recently established boundary line between Canada and the United States on the indigenous peoples who suddenly found their lands bisected. The rights and benefits originally set out by the Jay Treaty—now reflected by U.S. law in § 289 Immigration and Nationality Act—bestow upon Canadians with a 50% or better native bloodline theoretical privileges unparalleled by all but United States citizens to enter the U.S. and remain and work or engage in other lawful activity, virtually unrestricted by U.S. immigration laws. Qualifying Canadians, defined in statute as “American Indians born in Canada” may be of Indian, Inuit, or Métis background if bloodline can be documented. Meanwhile, upon becoming an independent nation, Canada failed to ratify the Jay Treaty. While its constitutional framework provides for protection of aboriginal rights; it is unclear whether, and to what extent, such protections extend to a right of free passage for U.S. born indigenous peoples seeking entry to Canada. In the wake of post-9/11 security enhancements, it has become increasingly difficult for indigenous peoples to exercise their border crossing rights to the extent they are entitled. Moreover, inconsistent and inaccurate information disseminated by government agencies on both sides of the border complicates an already sensitive and misunderstood issue. Please contact Kate Buchanan at kbuchanan@cascadia.com with queries. What do the Jay Treaty and the Iran Deal Have in Common? “The reality is that almost every president who has reached a major agreement with a U.S. foe has been viciously attacked, with treaty foes warning of dire consequences. But even as he is being battered over the Iran deal, Obama can take some solace from the fact all of those presidents were rewarded by sticking with the deal and ignoring popular disdain and stinging criticisms. Some of the venom was captured earlier this year in "A Brief History of Hating Treaties," by reporter David H. Montgomery of the St. Paul Pioneer Press. He recalled the criticism of the Jay Treaty in 1796 that dealt with the issues left over from the Revolutionary War. George Washington was too revered a figure to assail, so the critics went after Washington's chief negotiator, John Jay. Montgomery cited one newspaper editor who wrote sentiments about Jay not too far away from today's Republican attitudes toward Obama, referring to Jay as "the arch traitor—seize him, drown him, burn him, flay him alive." Who Puts the "Jay" in Jay Treaty? "Jay was one of three contributors to the Federalist Papers, which helped define American government. He was president of the wartime Continental Congress, then served as secretary of foreign affairs, precursor to secretary of state, after the Revolutionary War ended. He was an essential diplomat whose peace negotiations with England, leading to the Treaty of Paris, vastly expanded U.S. territory. For his accomplishments heading a network of informants during the revolution, actions that helped inspire James Fenimore Cooper's novel "The Spy," the CIA's website calls Jay "the first national-level American counterintelligence chief." He also helped write the New York Constitution, was a founder of the New York Manumission Society and as governor signed legislation that phased out slavery in the state (Jay himself owned slaves). The founders bickered colorfully among themselves, but they agreed on the virtues of Jay. Noting his centrality in the talks with England, John Adams praised him as "of more importance than any of the rest of us." Alexander Hamilton turned to Jay first when conceiving the Federalist Papers, and George Washington thought so much of him that when he was forming his original Cabinet, he offered the first position — any position — to Jay, who chose the Supreme Court."